As a mom, do you despair when you pick up your kids after school and all they want to do is eat? My children have been driving me a little crazy this long winter with their constant demands for food from 3-6pm! As a healthy mama, of course I have tried to give them fruit served all different ways, smoothies and veggie sticks with hummus. Lately, I’ve been getting frustrated with their growing sweet tooth or cravings for junky snacks. 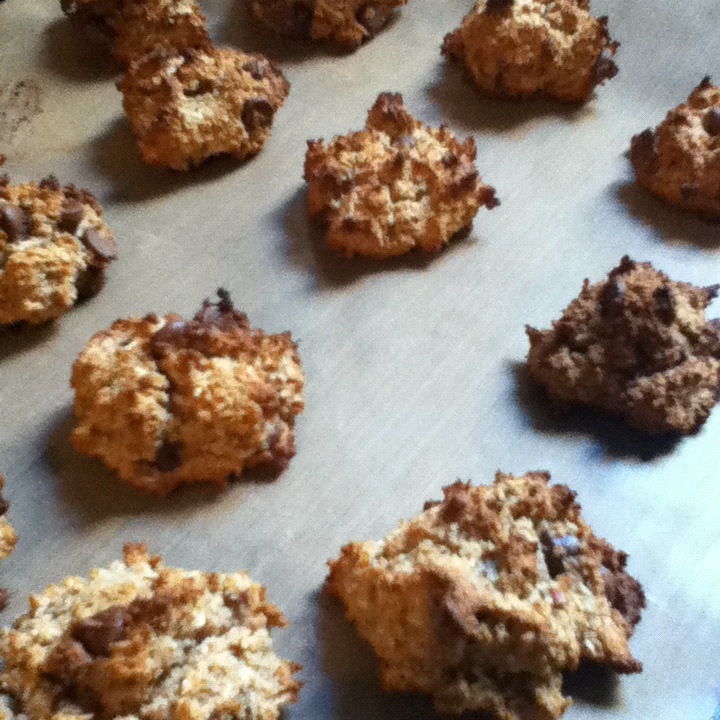 Caveman Cookies – fresh from the oven! On the hunt (pun intended) for a filling and healthy after school treat, I found inspiration in a nutty gluten free paleo cookie! Eating paleo in essence means removing cereal grains, dairy products, legumes, refined sugars and processed foods from your diet and filling your plate with meat, vegetables, fruits and nuts. It’s actually not restrictive at all because modern day paleo people add nut milk, butter, heavy cream, and nut flours to their diet so you can still eat most of the things you eat now just by switching a few things around in your pantry. And yes that means you can bake – one of my favorite things to do! Here’s the recipe for Caveman Cookies. One bite and you won’t be able to stop and your kids will love you forever. We love ours with dark chocolate chips. 3. Add the coconut flour, almond butter, and baking soda, and mix well. Using a food processor, chop the walnuts and apples until very fine. 5. Cover two cookie sheets with parchment paper or non-stick mats and spoon heaping tablespoons of the cookie mix onto the parchment paper, placing an inch or two apart. Bake for 25-35 minutes until golden brown and cooked through. Makes approximately 15-20 cookies.